Happy 2017 friends! I hope you had a fantastic holiday season and are almost over that awkward New Year's resolution phase. You know the one I'm talking about right? The one where you commit to eating salads and going to the gym everyday only to find yourself eating french fries on day 2? Yup, that one. As for me, I know I'm never going to quit french fries so I can only hope to balance them out with some salad eating the rest of the time. Now if we're going to be eating salads, can we please just agree they won't be the the light and leafy kinds? At least not all of the time? I mean seriously, we're eating salads. Can we at least make them a bit less painful and a lot more filling? My solution is to always add a grain. If you add farro, couscous, or my new love, barley, to a salad, all of a sudden, it becomes less of a salad and more of a hearty grain bowl. I'll often cook up a giant batch of [insert favorite grain of choice here] at the start of the week and use it for various meals throughout the week. It's weird but just having a container of cooked grains in the fridge helps me feel prepared and best of all, healthy. Don't believe me? 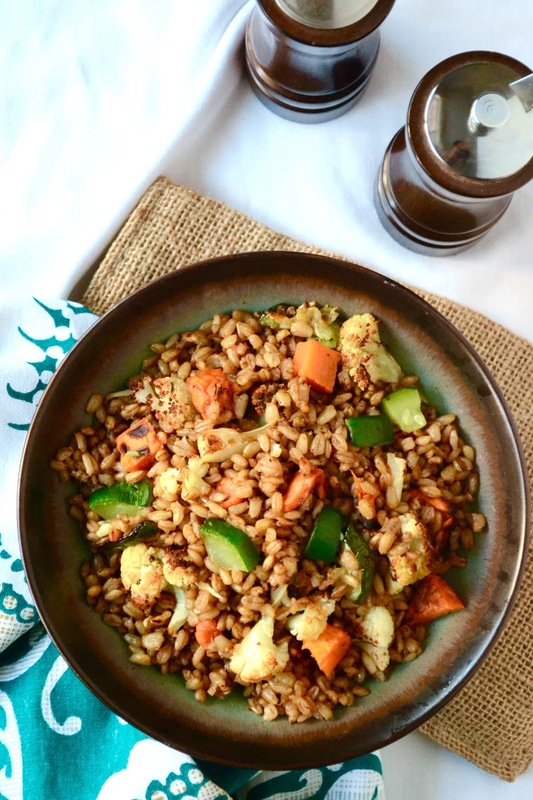 Allow me to introduce you to the Roasted Vegetable and Barley Salad. It's a big ol' bowl of comfort but in salad form. Gosh, I never thought I'd use comfort and salad in the same sentence. Unless that sentence was, "French fries are comforting and salad is not." But hear me out. We all know I'm a huge fan of roasted vegetables like this Roasted Cauliflower or these Honey Roasted Sriracha Carrots. Combine those roasted vegetables with my new love of grains and my January commitment to healthy eating and ta-da! You have the Roasted Vegetable and Barley Salad. I brought this salad to a potluck and it was a hit. I served it at a dinner party and it got rave reviews. And last week, I made it on a Sunday and ate it for lunch everyday until it ran out on Wednesday and it was awesome. I understand it sounds a bit silly to sing the praises of a salad so loudly and proudly but golly, if this salad is any indication, 2017 is going to be one heck of a year. Add barley to vegetable stock. Bring to a boil and then simmer until barley is cooked and stock has evaporated. While barley is cooking, roast vegetables. Heat oven to 400 degrees. Put vegetables on baking trays, coat lightly with vegetable oil, season with salt and pepper. Roast until tender, generally 30-35 minutes for sweet potatoes, 20 minutes for cauliflower and 10 minutes for zucchini. I like to broil the vegetables for 3 minutes after they're cooked to get some char on them. 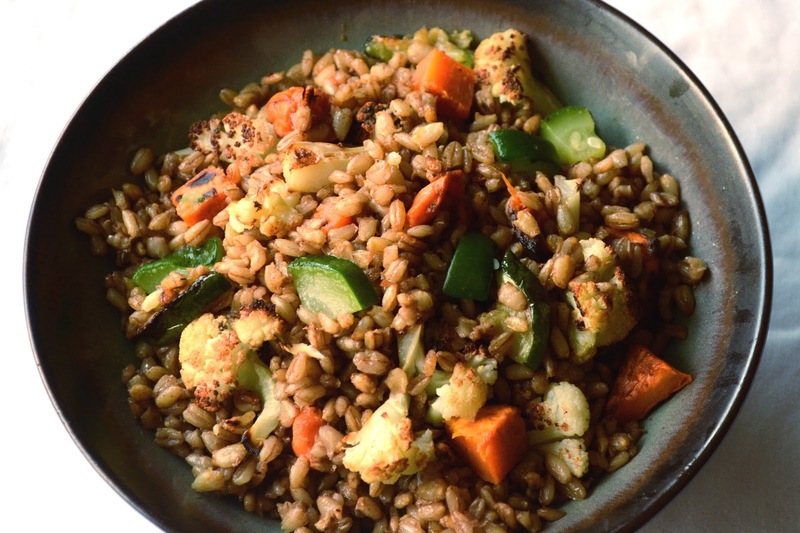 Mix barley and roasted vegetables. Add garlic powder, onion powder, chili flakes and balsamic vinegar and mix thoroughly. im the same way when it comes salad. it needs to be hearty // filling // delicious!